I’ve always liked the Adventures series. It doesn’t have many important stories in the context of the universe but it’s a really fun anthology for kids, it’s nice to jump around every month and see stories with different characters from every era of Star Wars (sometimes even featuring characters from the television series or other parts of the expanded universe). I wouldn’t recommend it if you’re looking for something that informs the greater universe but it’s still a cute and fun series that I like reading once a month. This month’s main story is pretty simply. 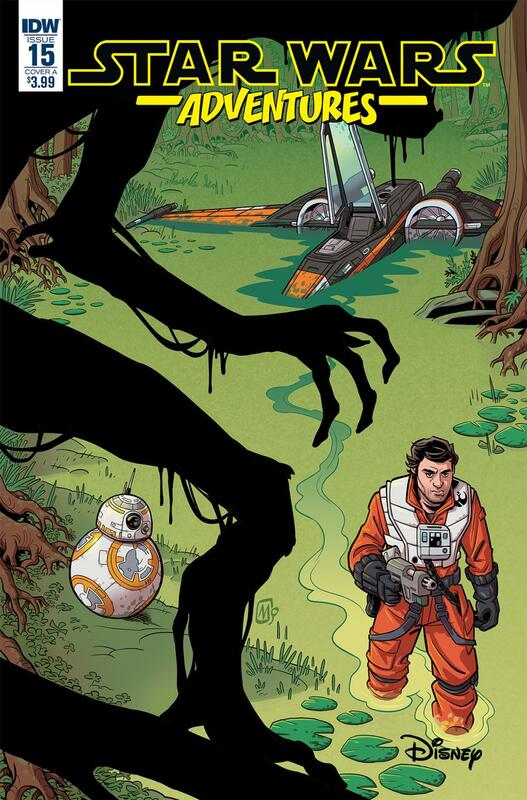 Poe has come to a swamp planet with BB-8 on a mission for the Resistance and he’s attacked by some natives before being rescued by a young child in the swamp as a rite of passage. They work together to get Poe back to Black One so he can leave. Nothing very unique or distinguishing but it’s still a nice little story. I wish it had done a better job explaining why Poe went to the planet in the first place. The beginning of the comic vaguely mentions that he’s looking for a contact and it’s dropped for the rest of the story, his goal is just getting back to his ship. The back-up story continues the Flight of the Falcon arc that is currently running between this comic and a couple of junior novels. Bazine is still interrogating different people who have encountered the Falcon in the hope of tracking the ship down. This time she talks with a pair of droids that encountered the ship in the Rebellion era when Luke, Han, Leia, and Chewie visited the planet Lotho Minor (the same planet that Maul was introduced on in The Clone Wars) looking for a place the Rebels could use as a base. It’s a fairly basic story, I found the last Flight of the Falcon back-up to be a lot more interesting conceptually, but it’s still always fun to see the Original Trilogy crew together like this and the writing is solid. The art was pretty good in both the main and back-up stories. I especially liked the art in the back-up, I think it suits the series. Overall, it was an enjoyable issue. Nothing really notable but still fun. The main story is more or less what I expect from the series, just a quick read that’s nice but doesn’t have anything that memorable. I’m enjoying the Flight of the Falcon line much more than I thought I would when it was announced and I think Moreci’s writing is a decent part of that, I’m enjoying the comics side of the line more than I’ve enjoyed the book side so far. The hook at the end of the back-up has me especially excited for the next issue, I have a really good feeling about it.